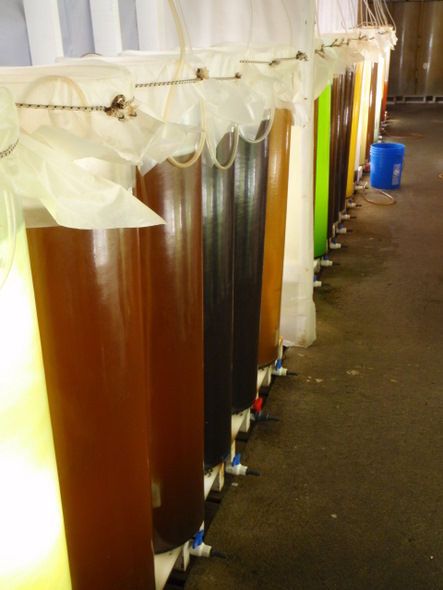 250mL algae culture flasks and the larger mass microalgal culture in fiberglass tubes ( ca. 90 L each). The light brown microalgae in the foreground of the tubes is Isochrysis galbana (clone T. iso). 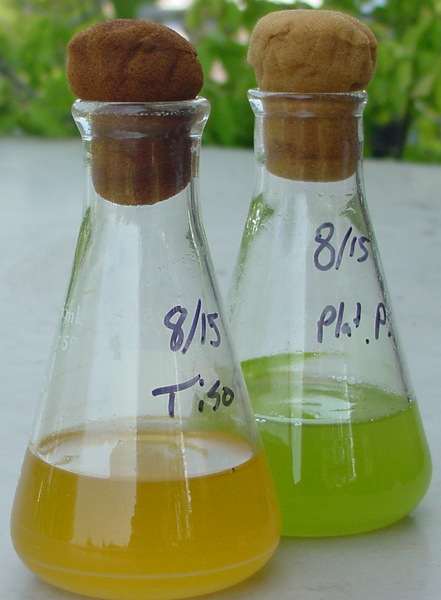 Microalgae (unicellular algae) is the food source for all shellfish. Microalgal production is necessary to condition broodstock and rear larvae and juveniles. DEI’s 2018 facility expansion added a 6,000 ft2mezzanine level for the production of our stock microalgal culture system and mass algal growout system. This addition also freed up space to rear more shellfish on the first floor of the hatchery. DEI raises a variety of diatoms and flagellates. Diatoms include Chaetoceros gracilis, Chaetoceros muelleri, Thalassiosira pseudonanna, and Thalassiosira weissfloggii. Flagellates include Isochrysis galbana, clone T-Iso and clone C-Iso; Pavlova pinguis, Pavlova lutheri, Tetraselmis maculata, Tetraselmis chuii, and Rhodomonas salina.